Anytime our family gets a hankering for ice cream, there’s no need to hit up an ice cream shop with yucky ingredients! 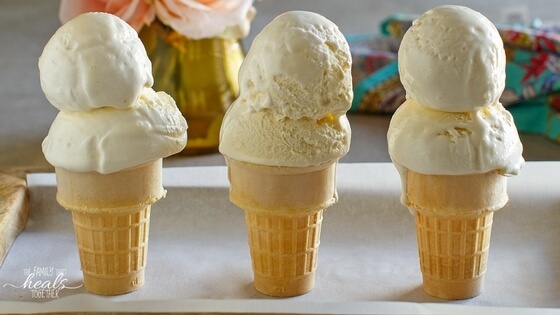 We use this simple, healthy, homemade vanilla ice cream recipe for a treat that satisfies! Serve it up with five minute flourless blender blondies. Undoubtedly, if I trick myself into getting store-bought or ice cream shop ice cream, we have behavioral fall out, and I’m likely to get a migraine or joint pain or both. It’s so not worth it! Thankfully, we can make better, healthier, and cheaper ice cream at home with this homemade vanilla ice cream recipe. Also thankfully? Summer isn’t over yet! (Not that I don’t make ice cream year round here in Texas, because heat.) If you’re wondering what to take to the neighborhood ice cream social, I’ve got you covered. Even friends and family who are used to eating ice cream with junkie ingredients love this recipe. 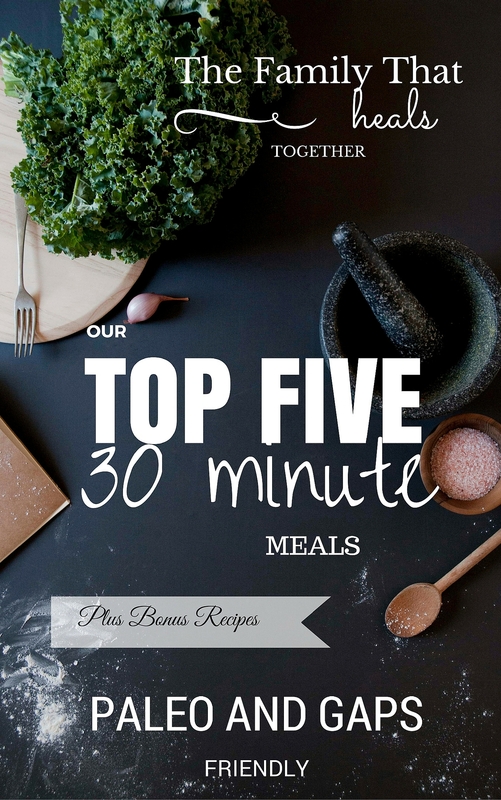 it can be ready in less than half an hour. It takes our family longer than that to get in the car. it doesn’t contain any fillers or artificial ingredients. it doesn’t contain any refined sugars. it’s full of good fats. it’s cheaper to make ice cream at home than go out. it’s SO good. Like, so good, y’all. Our family eats high quality dairy. It’s our personal preference and we seem to do fine with it. I think if you tolerate dairy, it can offer some great nutritional benefits, such as vitamins K and D, calcium, B vitamins, and a good mixture of fat, protein, and carbs. I really believe raw milk is a perfect, whole food, and our family thrives on it. This recipe uses cream and raw milk. Cream, while it does contain the milk sugar lactose, does not contain the milk protein, casein. We seem to do ok with organic, grassfed cream from the store, despite being pasteurized. I don’t use it daily or even that often, other than to occasionally make a bulletproof latte or this ice cream. Raw cream is even better, but costs twice as much as the store-bought variety, so I only spring for it every one in a while. I will not buy milk from the store. Ever. Pasteurized milk is a dead food that is very difficult to digest. Raw milk, by contrast, has live, active cultures which help your body to break it down. I have also made this recipe with store-bought cream and almond milk, when I wasn’t able to get raw milk, and it worked wonderfully. IF you can’t do any dairy, you could try coconut cream in place of the cream, but I have not tried that substitution. Our family eats raw eggs. All the time. Preferably from our back yard hens, but they now live six hours from us with my parents, so we stock up when we visit. If I can’t get those, I use pastured eggs from the store and have had no problems. The combo of sweeteners in this recipe is what gives it a nice, neutral sweetness. However, you can use one or the other if you’d like. By the way, if you decide to throw this lovely soft serve into some almost-sorta-paleo-ish ice cream cones (yes- they exist! ), I won’t tell. I get these or these. By the way, this ice cream is more of a soft serve. 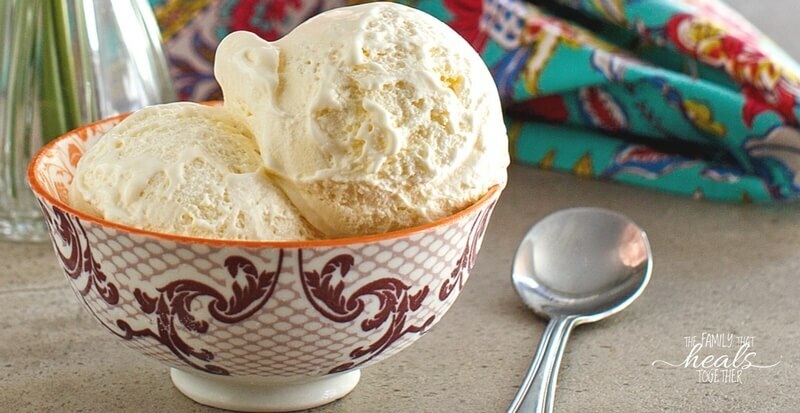 Ever make homemade ice cream and wish it could be a little softer, less icy? I’ve found the perfect combination of cream and milk to make a dreamy soft serve consistency. Don’t over blend it because the cream may get clumpy and try to turn to butter on you! And now for the main attraction: the homemade vanilla ice cream recipe. Without further ado. Blend on high until well-combined, for about 20-30 seconds. Do not overblend. 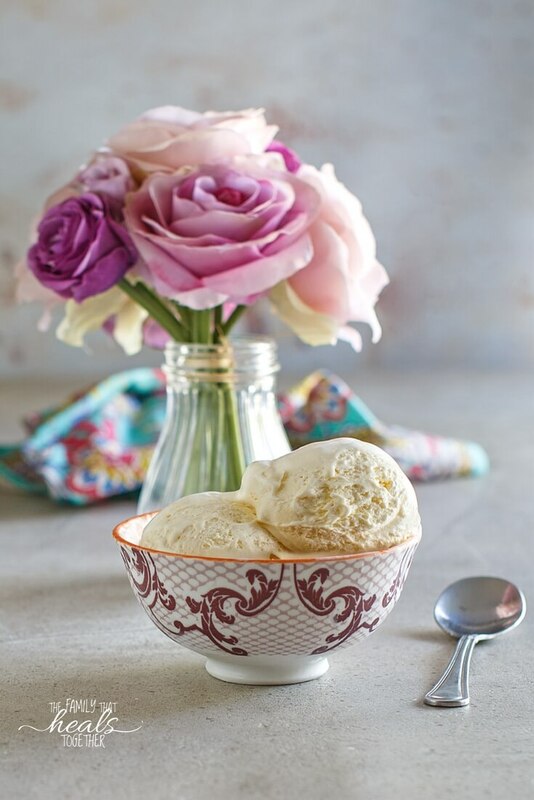 Would your family or friends love this homemade vanilla ice cream recipe? Be sure to pin the image below or share using one of our links! Have you ever tried using the GAPS sour cream for the ice cream base? That way it is fermented and without much lactose?